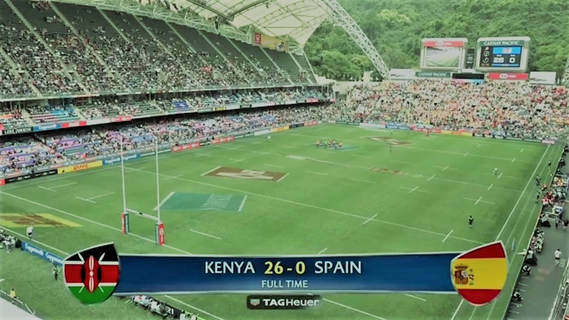 The Kenya Sevens team dazzling form continued on Saturday morning as they beat Spain Seven 26-0 in their second pool match of HSBC World Rugby Sevens Series at the Hong Kong Stadium. Fresh from setting new milestone where he scored his 100th try on the HSBC World Rugby Series during Kenya's 33-10 win over Spain, Willy Ambaka was again the inspiration for Shujaa as he scored two tries with Collins Injera ending the first half with an easy run-in for a 19-0 lead. Jeffrey Oluoch added the last try for Kenya in the second half while Sammy Oliech did the donkey work of converting three times for Kenya's 26-0 win. Kenya 7s will face Australia Sevens in the final pool match.